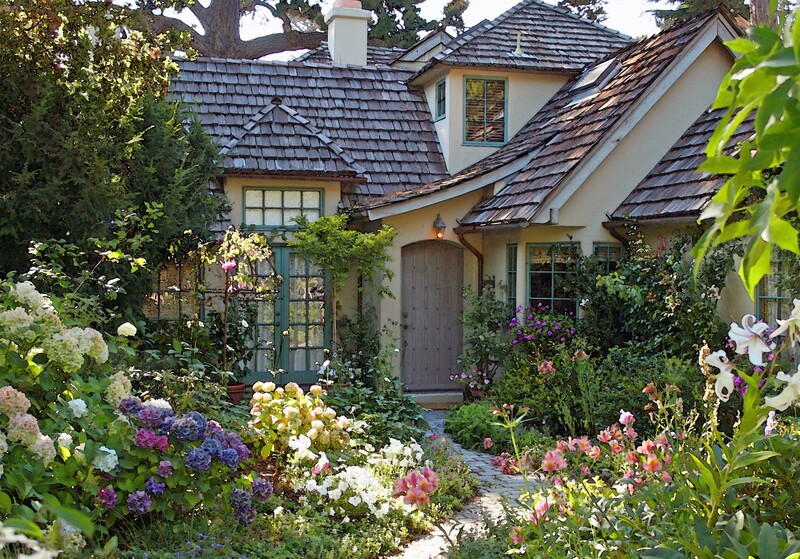 As I photograph gardens and talk with their owners, it becomes clear that not all Carmel gardens enjoy equal growing conditions although all are in Zone 10 A. 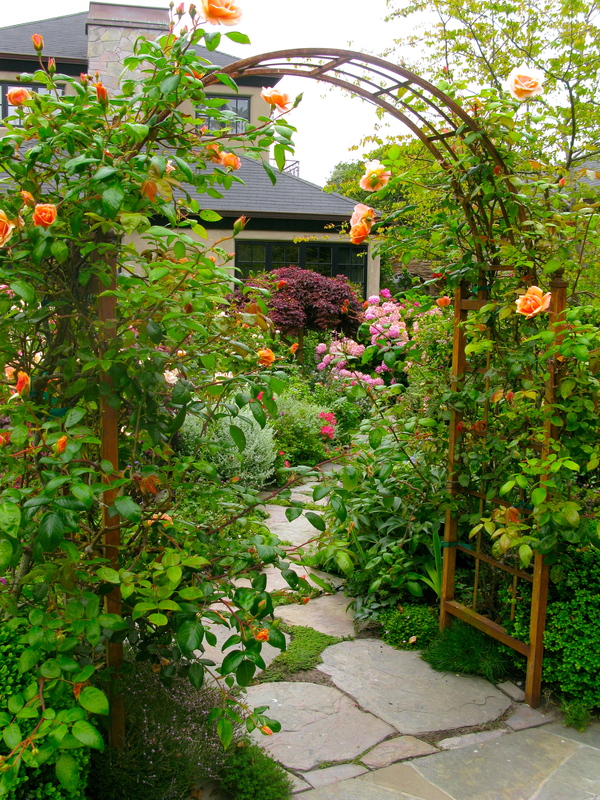 Gardening zones are determined by temperature. But here wind, salt air, and sandy or rocky soil play a huge role. And these conditions can be quite different just 3 or 4 blocks in from the ocean. 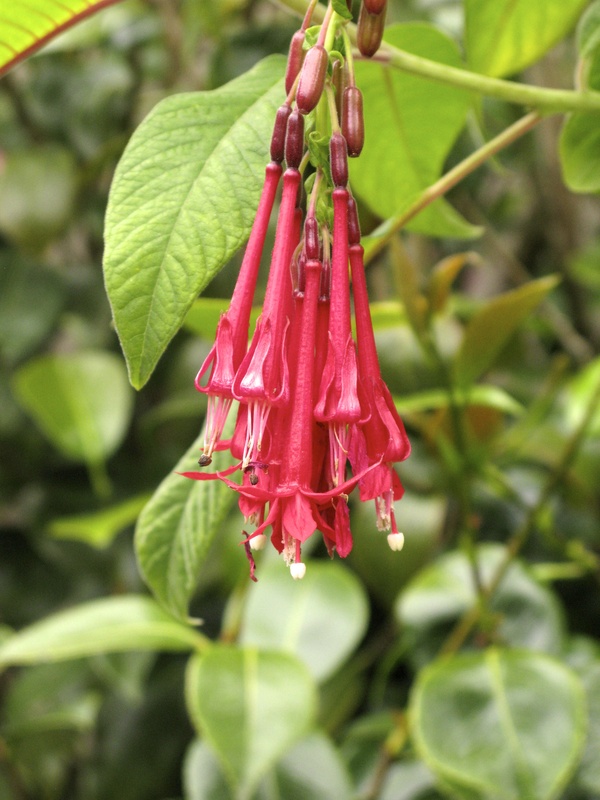 Have less protection from the elements and they choose their plant palette accordingly. 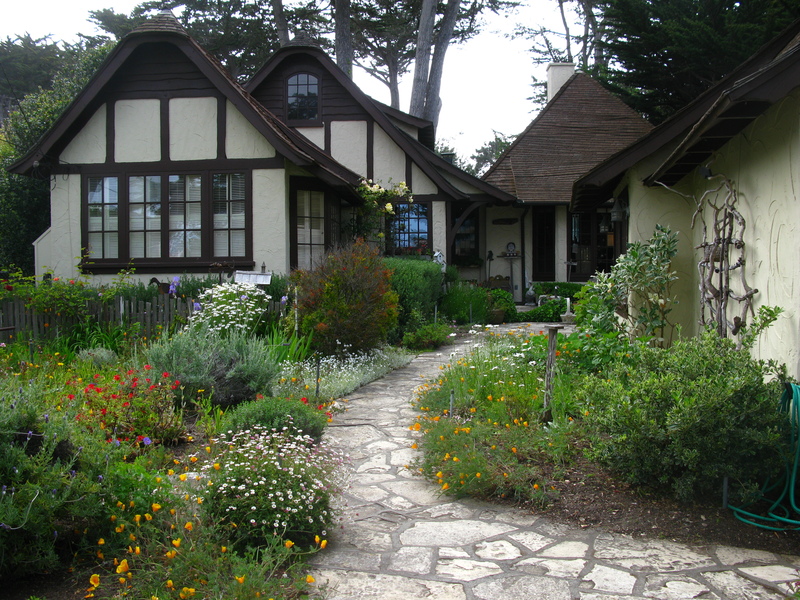 5 blocks from the beach, # 5 Casanova has many more plants to choose from. As does the Lincoln Green Inn. 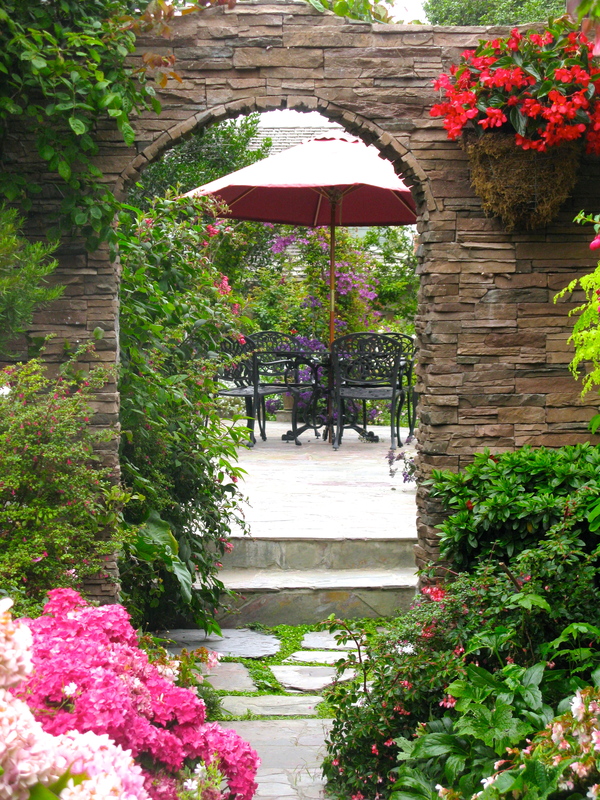 This trip, I notice this lush garden. 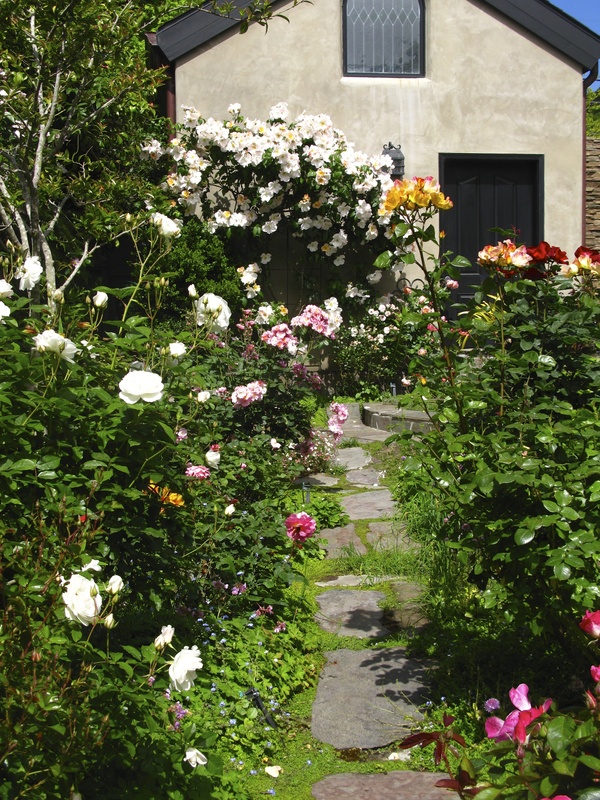 I am so impressed that I leave a note on the front door asking if I might photograph the garden. The owner, Teri Winton calls back. She laughs when I tell her I am amazed at the variety of her plantings. She jokingly says that they live in the “Banana Belt”. A Banana Belt is any segment of a larger geographical area that enjoys warmer weather than the region as a whole. This is a very talented gardener. Let me show you around. 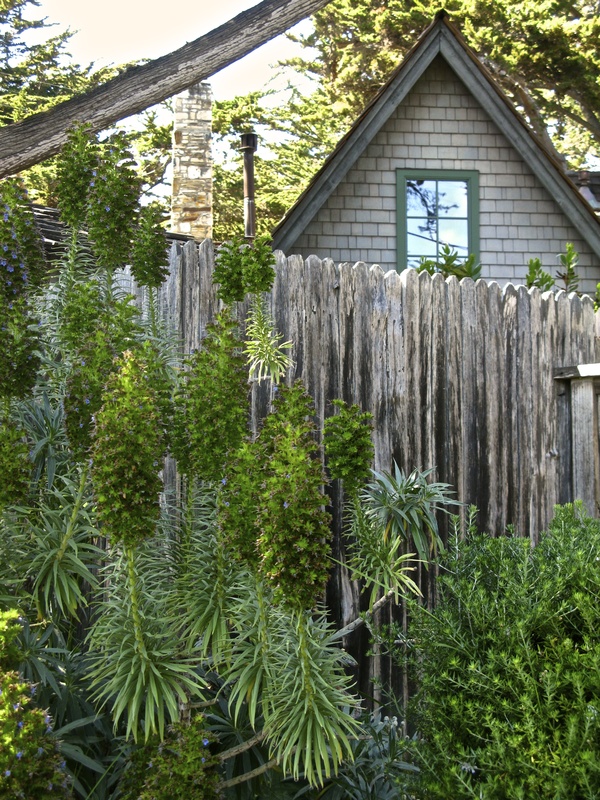 This is what I refer to as a “plantswoman’s garden”. 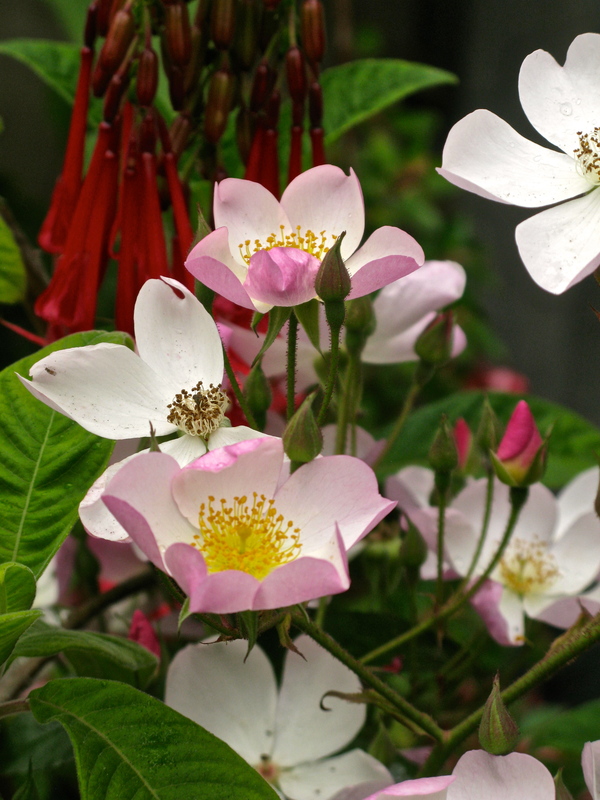 These tend to be highly dynamic gardens as the latest must-have varieties and hybrids keep claiming their place in the border. So much is going on that the design is crucial, but temptation frequently thwarts the good intentions of the master plan. 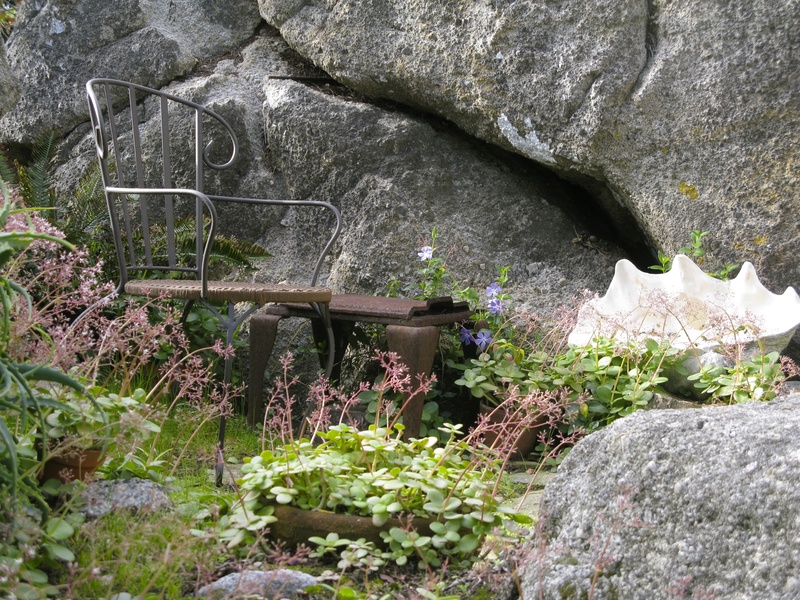 Seats and arbors are a good way of punctuating planted areas, while a network of paths makes the borders inviting places to meander through. 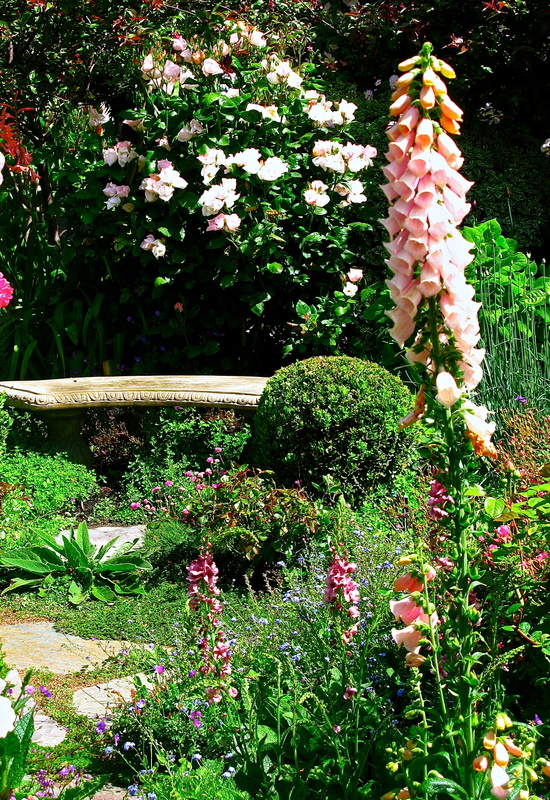 The charm is that these gardens are labors of love, with hours spent cherishing them. 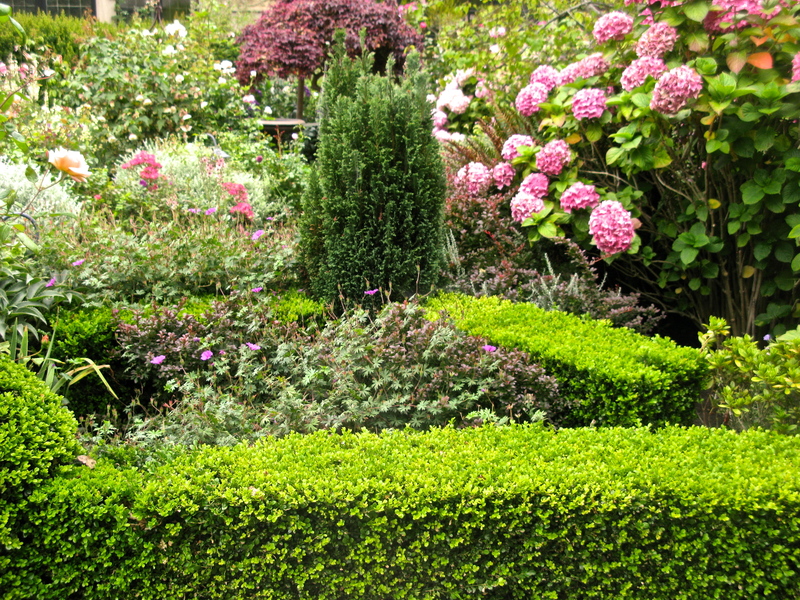 Irish yew and boxwood hedges form the parterre beds that delineate the front of the garden. 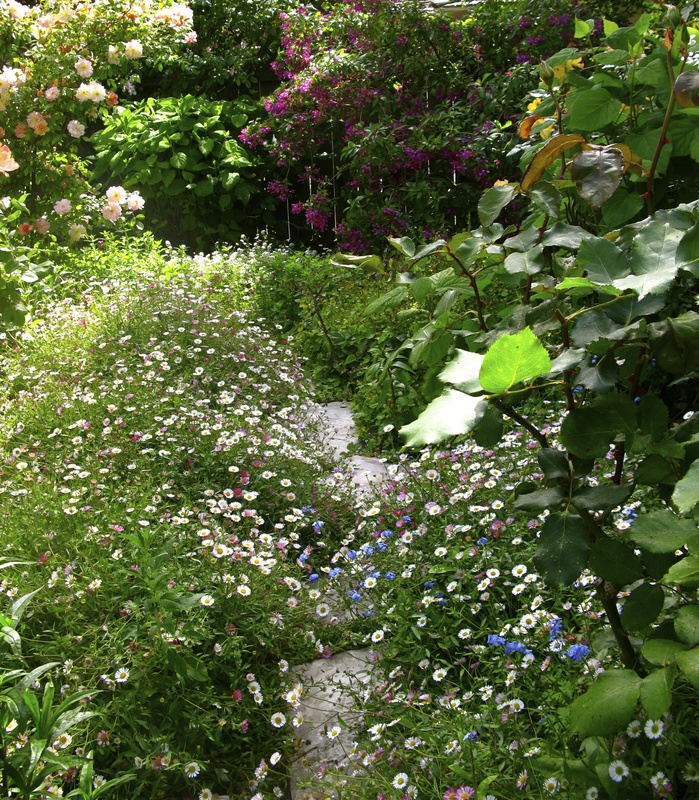 The path work lends structure, although it is fast disappearing in spots where the plants spill about happily. The bench at the end serves as a focal point as I wind my way through pink hydrangea, purple heliotrope, Verbascum, wallflower and dahlias. The bees are in seventh heaven. 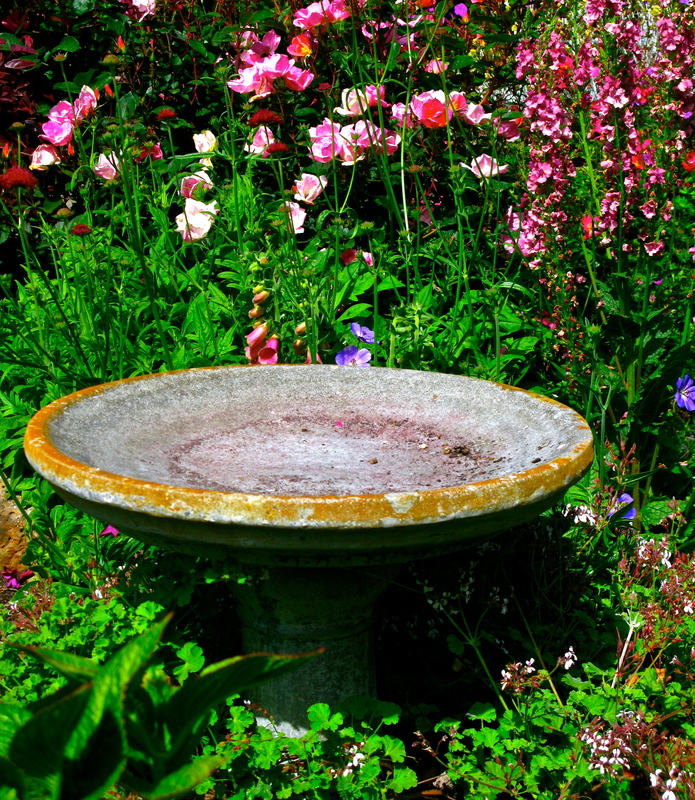 A birdbath is tucked into the dense plantings. Now I make my way to the right of the trellis. And this amazing sight. 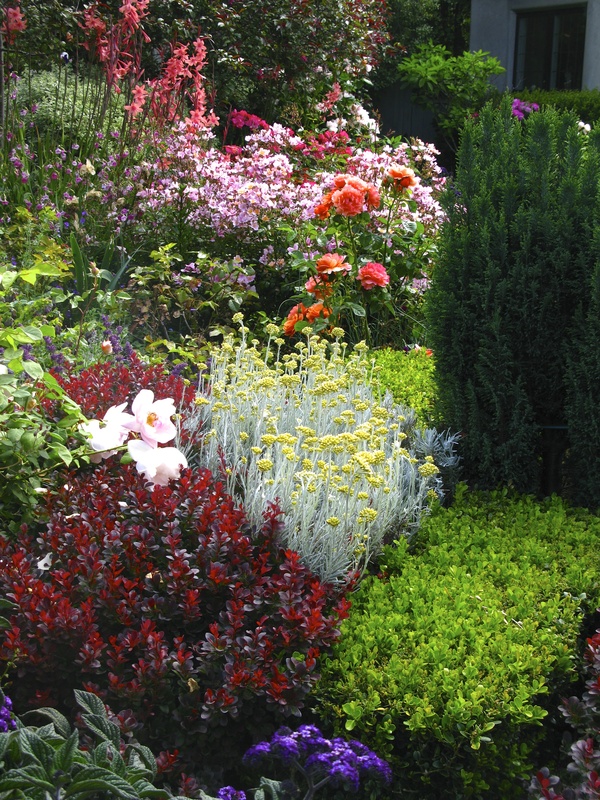 Boxwood, barberry, yew, heliotrope, pink and orange roses and yellow santolina in bloom. There is another entrance from the driveway marked by a conical boxwood. 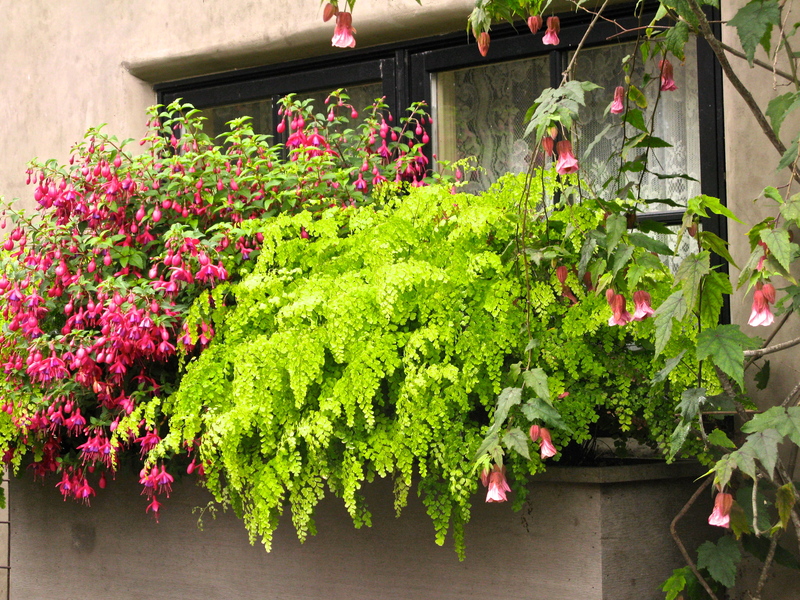 The garage window box shows off fuchsia, fern and Abutilon. 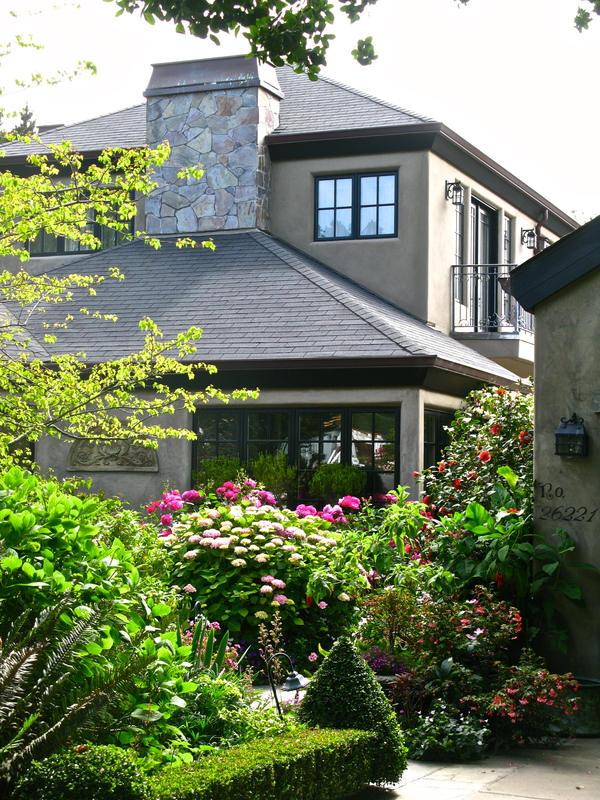 The stacked stone arch between the house and garage invites me to the large patio. 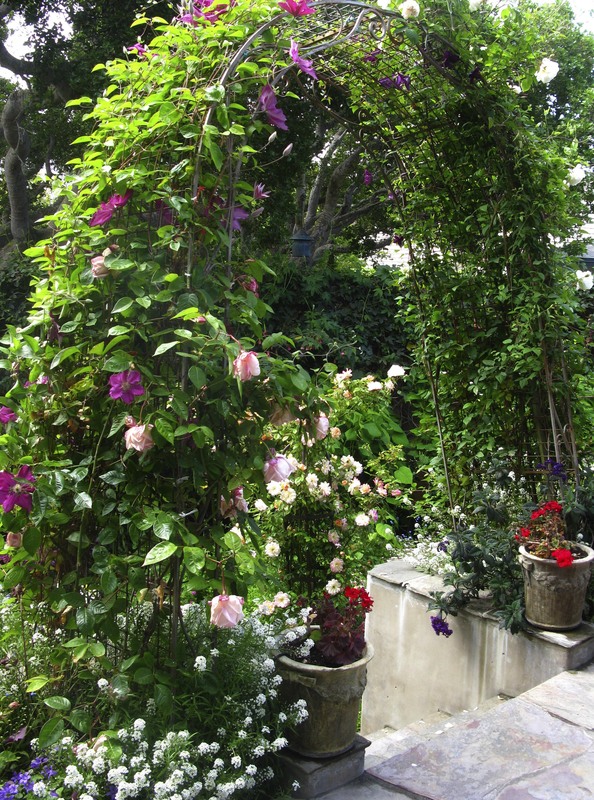 The patio is level with the house but a narrow planting bed is reached through this arch covered with clematis and roses. 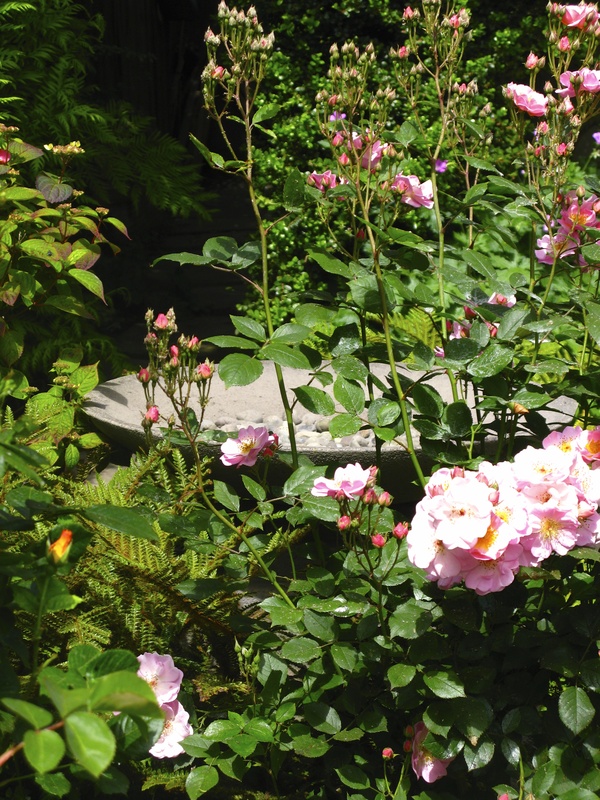 Could these roses be happier? And quickly moves them into the Santa Barbara daisies . 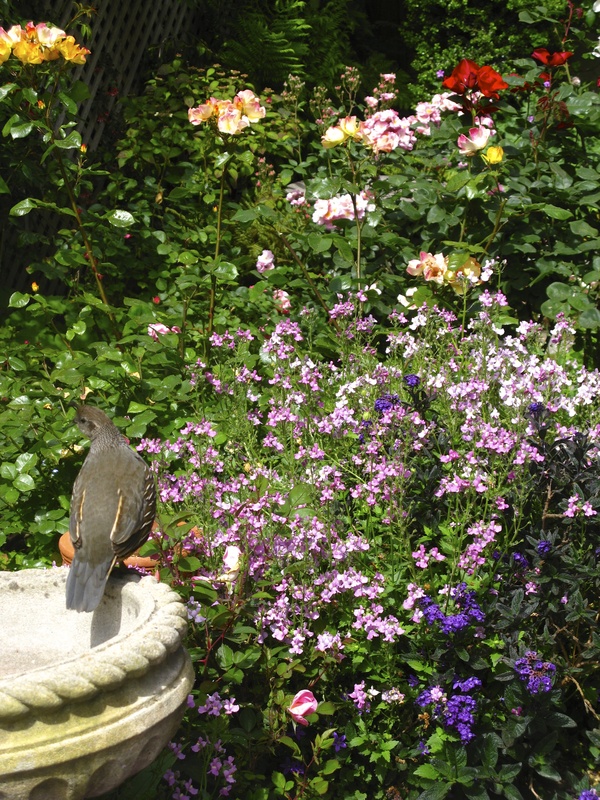 Surely the birds must love this garden with multiple birdbaths and sheltering plants. I follow the lower path to the garage and climb the stairs back up to the patio. 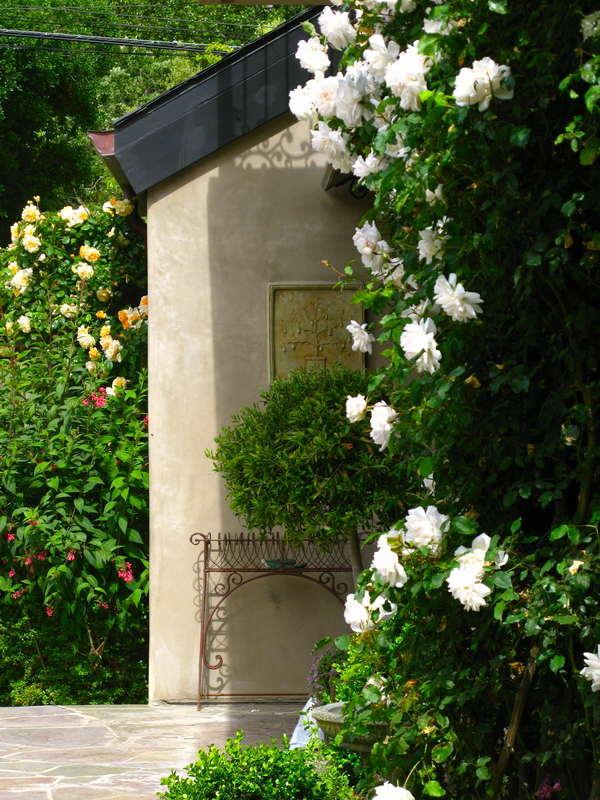 As you can imagine, the scent of the roses is delightful. 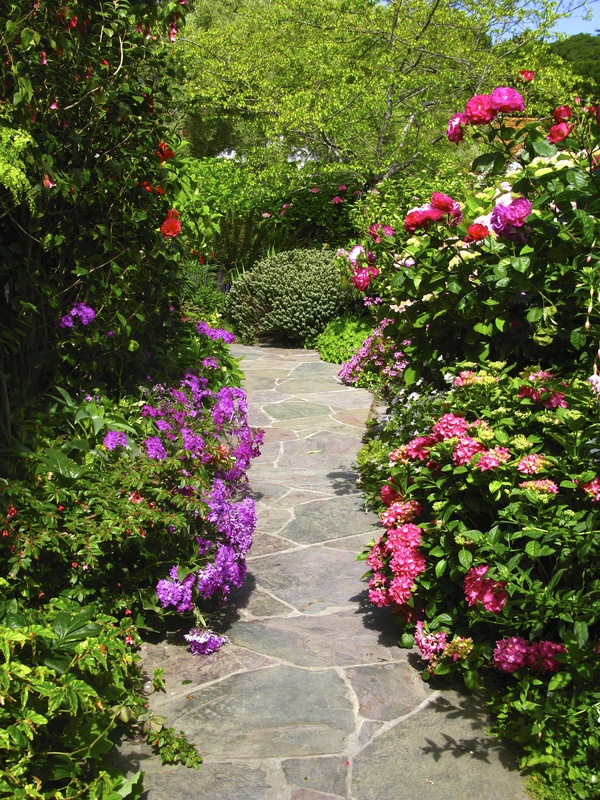 The flagstone path going back to the driveway is bordered by azalea, camellia, roses, purple senecio, and pink abutilon. Isn’t this a lovely sight. Thanks Teri for letting me tour. 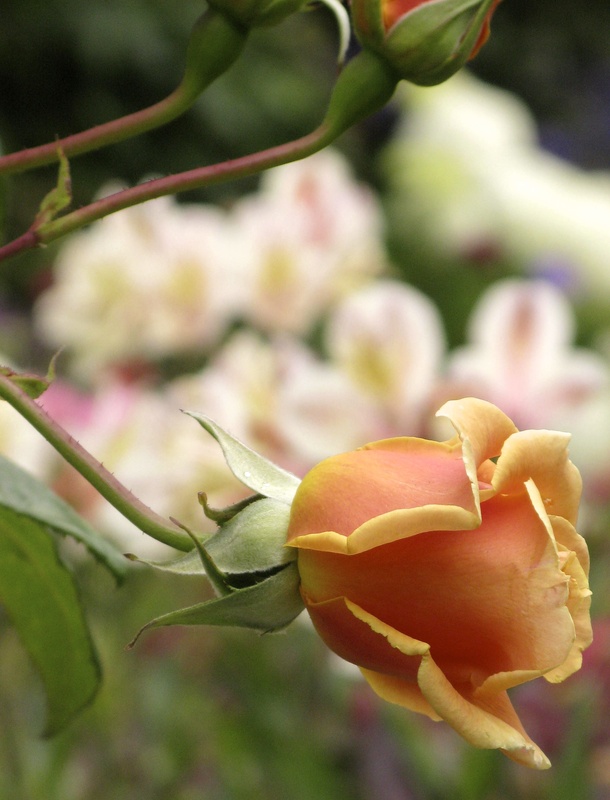 Just lovely Linda – beautiful photographs and gorgeous gardens. Wow, gorgeous! When were these taken? I can practically smell the heliotrope and roses. Summer is waning here in the southeast (zone 7). The hydrangea mopheads are drying in place, the roses are getting rather sparse (the old-fashioneds but a memory), the annuals are tired or going to seed. Only on the mountain did I see a renegade foxglove that bloomed this late. Autumn approaches. It’s supposed to get down into the 40’s this weekend. 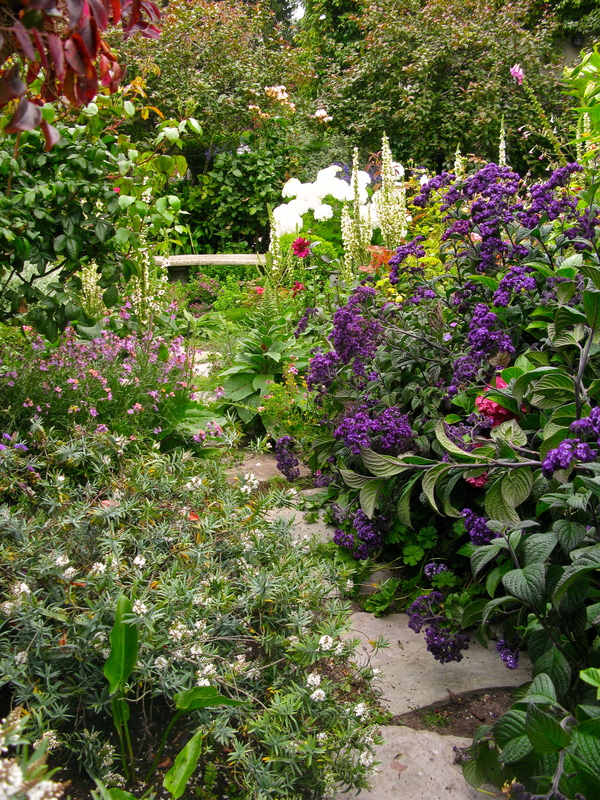 Seeing that lush heliotrope reminded me how I used to grow it in a container and overwinter it in my unheated sunroom. It must have gotten nipped one year because I haven’t grown it since. 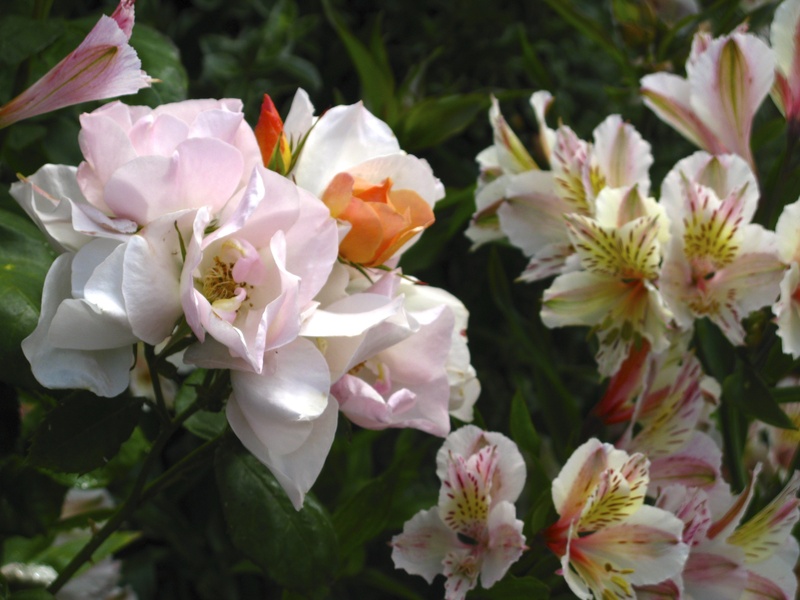 I was always entranced by the bloom and the scent. Lovely photos. 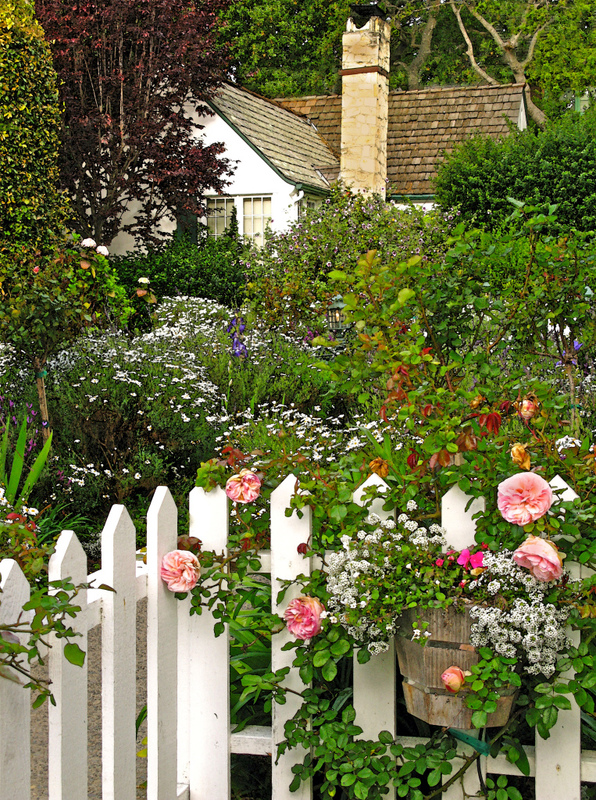 A very pleasant reminder of our visit to Carmel in May. Here, in the Scottish Borders, our summer has most definitely changed to autumn, with a definite nip in the air morning and night and the yellowing of the first trees. Linda, thank you again for documenting such beauty (and to Teri for nurturing it)! 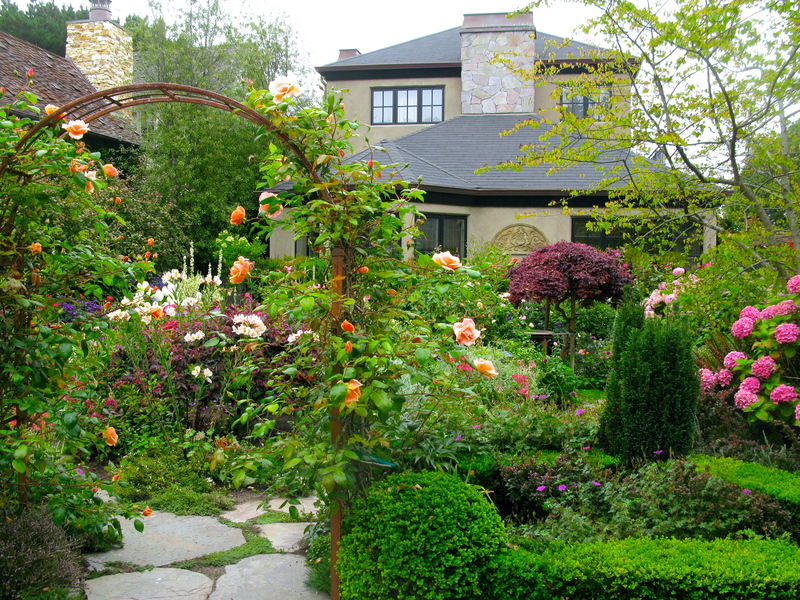 As you know, I struggle with my Midwest garden but the Carmel gardens continue to inspire me. Gorgeous, can almost smell the roses 3000 miles away. I just found you thru Sue at Housekaboodle and I’m so glad I did! Your blog is delightful and very informative. I also love to garden and tend to my itty-bitty- courtyard plot in New Orleans on a daily basis. 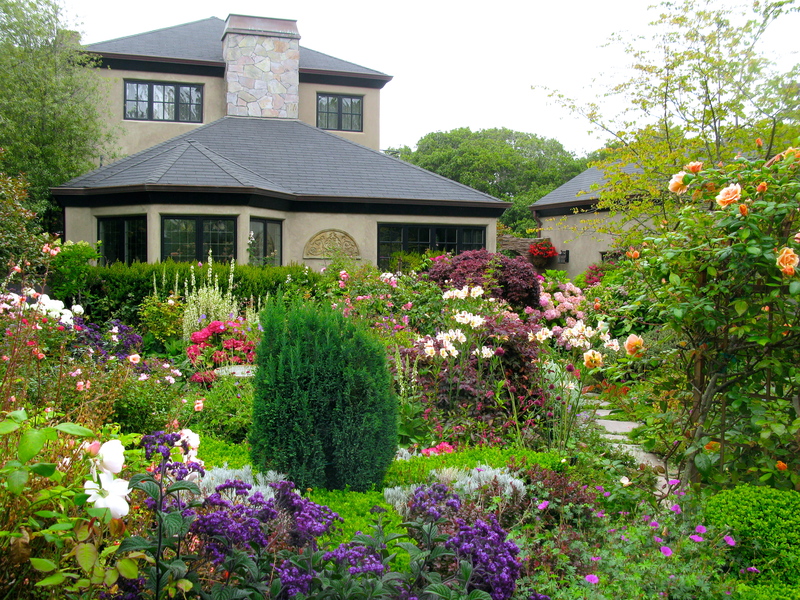 The garden you so beautifully photographed above is lovely. 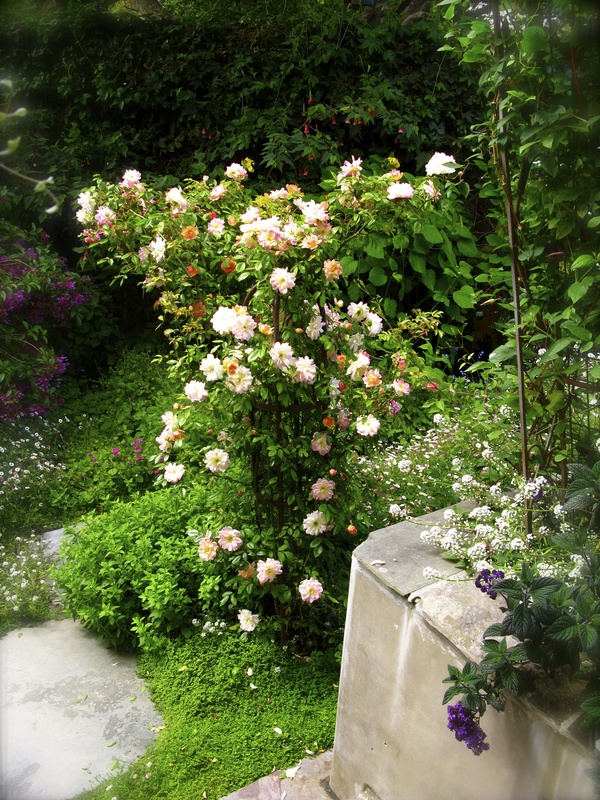 It has been my experience that gardens that seem so effortless often times take the most effort but are worth it. Just look at her results! Thanks for finding me and taking time to comment!